Rocky Speedway: Speedway returned to Rockhampton Show for the first time a number of years. With no pit area, the full grandstand had a bird's-eye view of proceedings in the infield and were able to see features of speedway racing they normally wouldn't see. According to Friday's race caller Josh Keene, this made the event unique. "We had 50 cars in total, which was brilliant," Keene said. "There was no pit area, so all the cars, crews and drivers were on the infield and it gave a great view for the crowd. A lot of the stuff that happens behind the scenes at a race meeting was all on display for the crowd and it made a wonderful spectacle. It was a great atmosphere." The highlight of the night's racing was the super sedans, with six cars competing. Local driver Damian Arnold, in his first super sedan race after making the move from super stockers, brought the large crowd in the grandstand to life. 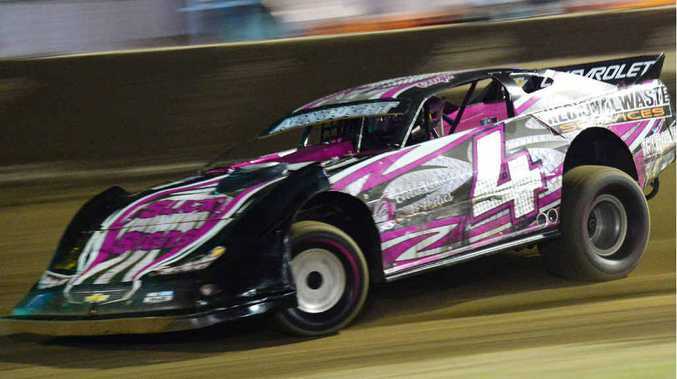 "Damian Arnold had his first drive in the super sedans and he was leading one of his heats," Keene explained. "Then he snapped a steering arm, rode the fence and nearly put the car on its lid. That certainly woke the crowd up ... it happened right in front of the grandstand." Two other local drivers, brothers Lee and Matty Williams, continued their fierce super sedan rivalry. "Lee and Matty Williams resumed their brotherly rivalry," Keene said. "They had a great battle and quite often found themselves side by side, rubbing panels. It was very exciting and fantastic racing to watch." There were no points on offer, the night's racing a demonstration for the appreciative crowd, but the drivers didn't see it that way. "There were no competition points on offer, it was more of a demonstration event," Keene said. "But try telling that to speedway drivers. Once the helmet goes on, it's on. It really was a great night of racing."